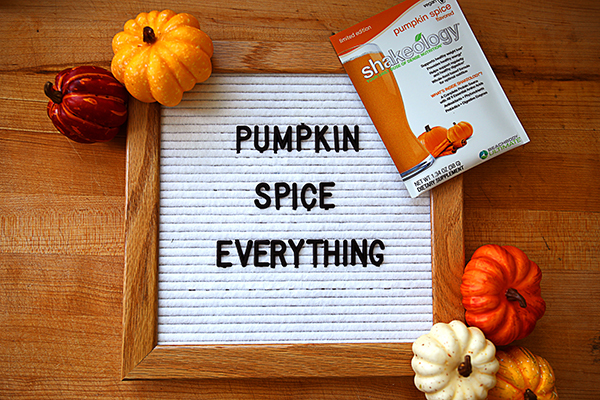 Due to overwhelming demand of our first seasonal Shakeology flavor test, Pumpkin Spice Vegan Shakeology is out of stock in the U.S. and Canada. Please check out our other delicious Shakeology flavors here! Pro tip: If you’d like to re-create the pumpkin spice flavor on your own, check out the recipe below using Vanilla Shakeology. Now you can enjoy the delicious taste of fall — without derailing your health and fitness goals. Autumn means cozy sweaters, colorful fall leaves, and — oh, yeah — your favorite pumpkin spice beverage! And that’s exactly why we made Pumpkin Spice Vegan Shakeology. This rich and creamy vegan shake features notes of pumpkin spice — cinnamon, nutmeg, and ginger. It’s incredibly tasty on its own, mixed with milk or almond milk for a creamier version, or simply added to your favorite Shakeology recipes. It’s meticulously crafted with a potent blend of protein, probiotics, digestive enzymes, antioxidants, vitamins, and minerals. No need to stop by the coffeehouse for a sugar-loaded calorie bomb this year! So get ready to enjoy your best fall yet! 1. Place almond milk, ice, Shakeology, and pumpkin pie spice in blender; cover. Blend until smooth. A great snacktional or enjoy as part of breakfast.